Donna Nelson, pictured here atop Fairview Mtn, directs the updating and reprinting of Gem Trek maps from offices in Cobble Hill, BC. The company began creating maps for the mountain parks from offices in Cochrane, Alberta, before moving to Vancouver Island. When we published the first editions of the Canadian Rockies Trail Guide, we only recommended government-produced maps from the National Topographic System (NTS) 1:50,000 series. Despite the fact that trails were sometimes misplaced (or simply not shown) and bridges and campgrounds unmarked, these were the best topographical maps available. Then, in 1992, Gem Trek arrived on the scene. 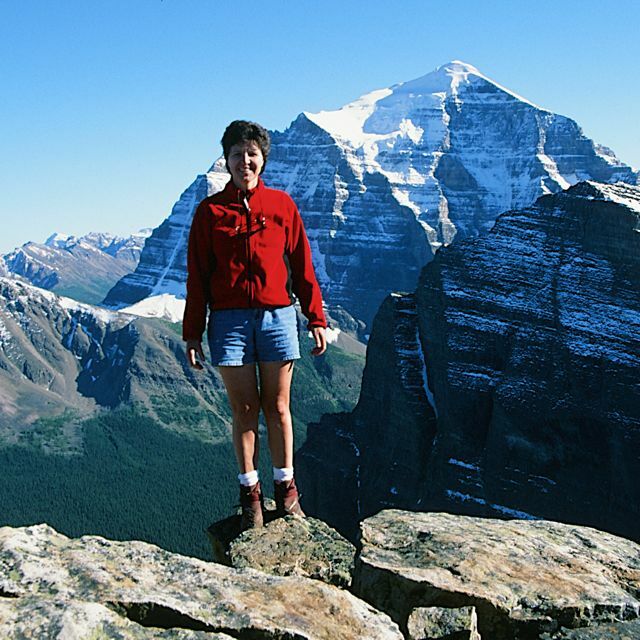 Roger and Donna Nelson were husband-wife owners of Calgary’s retail map and travel bookstore Map Town, who saw the need for locally-produced maps specifically designed for backcountry recreation. Gem Trek’s first maps covered the NTS 1:50,000 quadrants of Spray Lakes and Kananaskis Lakes. In addition to the same topographical information found on the NTS series, they provided accurate coverage of cultural features, recreational facilities and, most importantly, all the trails and popular routes. 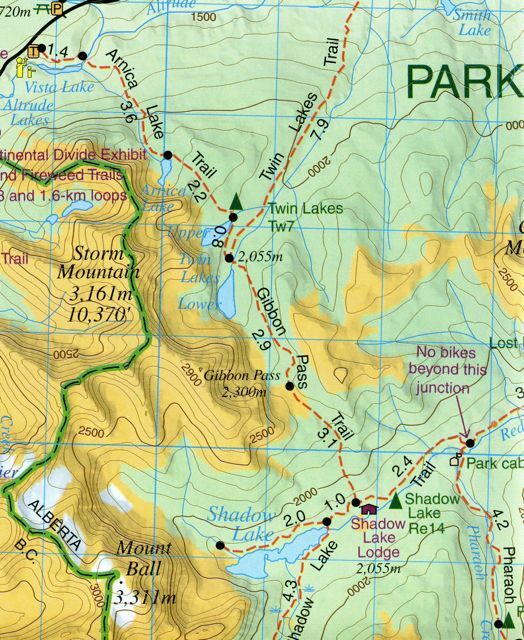 By the mid-1990s, the company expanded its coverage into the mountain national parks and was producing topographical maps with relief shading, much like those found in the mountain regions of Europe. In 1996, Banff National Park contracted the company to create maps for its trailhead kiosks; Yoho and Kootenay Parks did the same soon after. When it came time to release a new edition of the Canadian Rockies Trail Guide in 2000, we set aside our prejudice of not endorsing privately produced products and added references to the Gem Trek 1:50,000 series. Though other independently produced maps have been published over the past decade, Gem Trek still provides the most up-to-date information on the most attractive and durable maps (many are printed on waterproof plastic). Much of that information is contributed by a community of enthusiasts—backcountry recreationists, national and provincial parks personnel, and trail guide authors. Of more than 4,000 kms of trail shown on their maps, approximately 75 percent have been GPS-tracked on the ground by the Nelsons or one of these contributors. “Our favourite part of map making,” as Donna says, but unfortunately only a very small portion of the labour involved. Yes, there are other maps available these days, but I’ve never seen any updated with the regularity of those at Gem Trek. If I’m headed to an area within Gem Trek coverage, I always pull the latest edition of that map from my filing cabinet and tuck it into my pack. Digital maps on tablet devices may threaten the traditional map, but a “real” map provides a wider view, it doesn’t depend on batteries, and it doesn’t short-circuit when you drop it in the lake. Click on the map for an enlarged sample from Banff & Mt Assiniboine. Gem Trek maps are widely available at retail outlets throughout Alberta and eastern British Columbia.